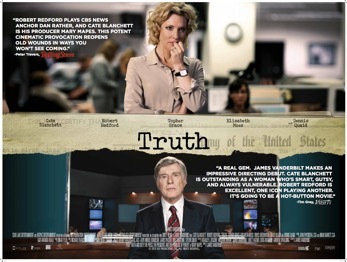 TRUTH is the true story of Mary Mapes (played by Cate Blanchett), an award-winning CBS News Journalist and Dan Rather (played by Robert Redford) of famed US news hour “60 Minutes” and their story that a sitting US president may have been AWOL from the United States National Guard for over a year during the Vietnam War. When the story blew up in their face, the ensuing scandal ruined Dan Rather's career, nearly changed a US Presidential election, and almost took down all of CBS News in the process. The club has only 60 tickets available in the intimate setting of Warner Brothers screening room so this special event is sure to be a quick sell out. Online sign-up as of 8AM on Wednesday 3 February at http://hcuk.clubs.harvard.edu. All proceeds go towards the club’s Schools and Scholarship Fund to support undergraduate outreach and VISITAS travel for new admittees in need.